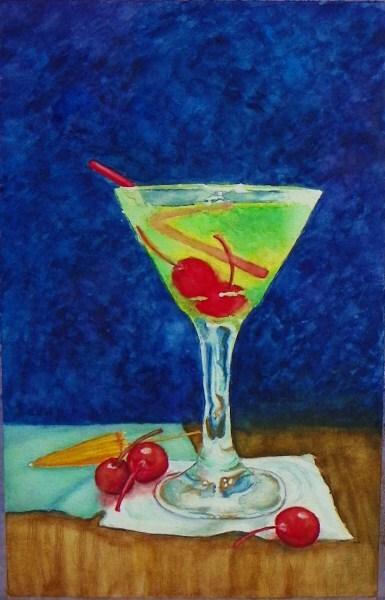 My adventure in watercolor has brought me to a new challenge, Glass. Well at least an “Appletini” challenge for now. Up until now any attempts at glass were as sketches or ink drawings, I usually get as far as the outline and basic shadows. Oh and did I say only in my private sketch pads where no one else would see. Something about glass just didn’t click. So, now I am challenging myself and I have committed to painting something that I have always had difficulty with and “Not what you think you see” ringing in my ears. The results!! I’ll let you be the judge!! The future is ‘foggy”, but mountains of fun! When the fog clears, inspiration follows!! Deb...this is wonderful...love your colors, your clean reflections...looks like you "got the hang of it" to me. I follow my muse into what ever unique creative inspiration or medium she takes me. I create because she is part of my nature, I share because I want you to see what I see and who I am.